Loot Crate April Unboxing | The Arcade Archives! 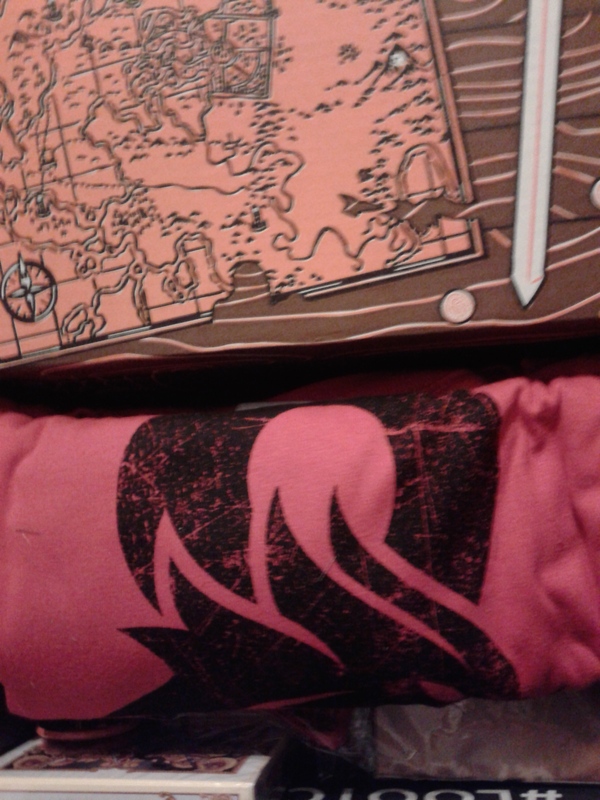 Since my crate did arrive earlier then normal I want to make sure you understand if you haven’t gotten yours yet there will be SPOILERS!!! So don’t get mad at me if your crate is spoiled you were warned!!! This is your last chance! SPOILERS Ahead!!! I don’t know about he rest of you but for me, opening the Loot Crate is a family affair. My son and I. Then we tend to fight over the contents of the box. LOL Its kind of like calling dibs over the cool stuff. Its like that will any crate that comes to my house. First things first look at this awesome tee that was in the crate. 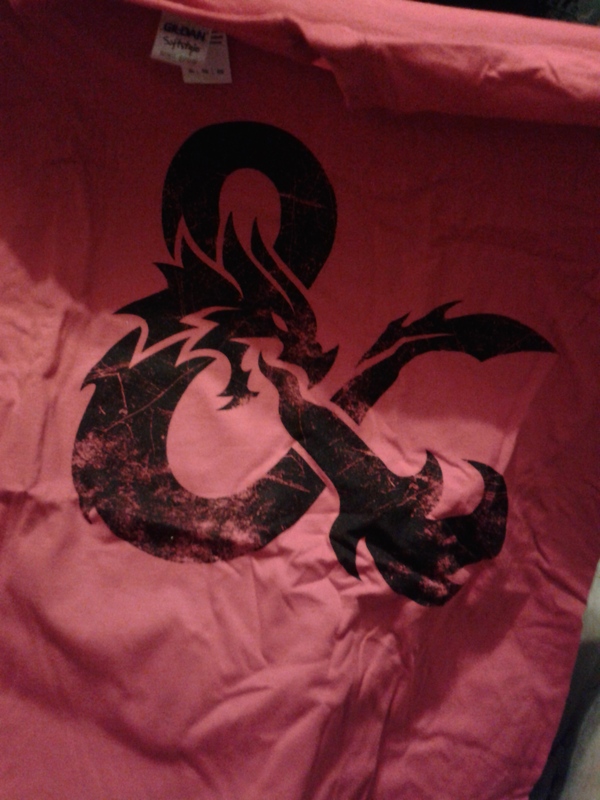 This is a fantastic Dungeon & Dragons shirt. I love the distressed dragon design. I do wish the shirt its self was a different color. I tend to not be a huge fan of red and I’m getting way to many red shirts. I mean don’t get me wrong I’m glad they aren’t always black or navy but I wish they were a different color, than red. Can I just tell you have excited my son was to pull out this bow tie? It’s so weird he loves ties. 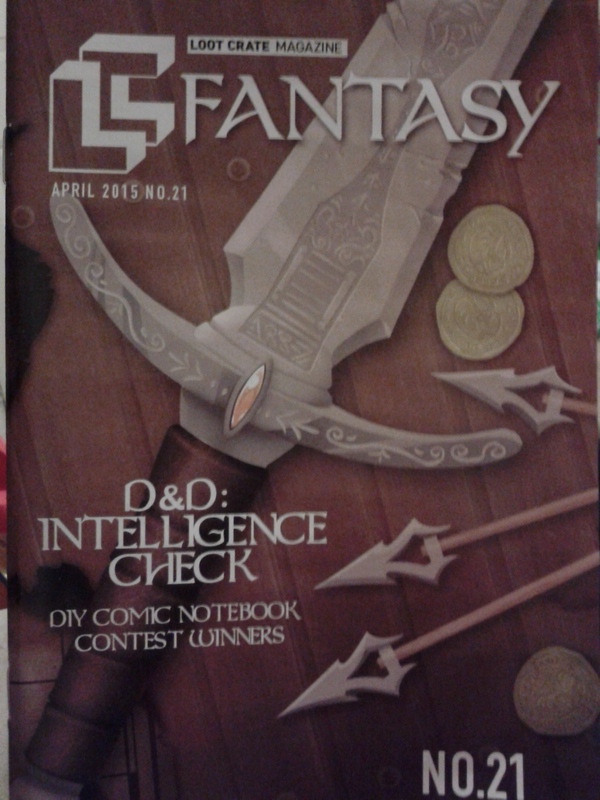 This one has gold dragons and 20 sided dice on it. 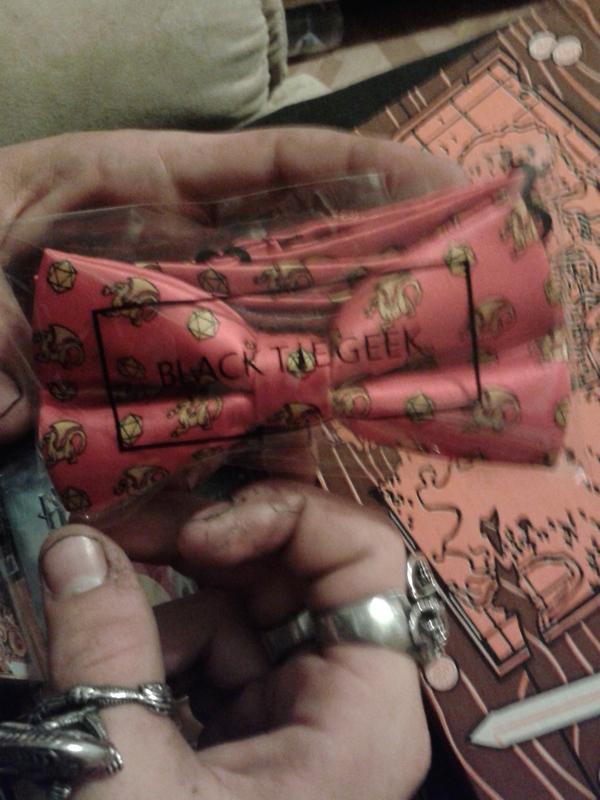 Its still in the bag because I think Black Tie Geek should get credit for this great design. I know this is going to look great on. Winter is Coming!!! 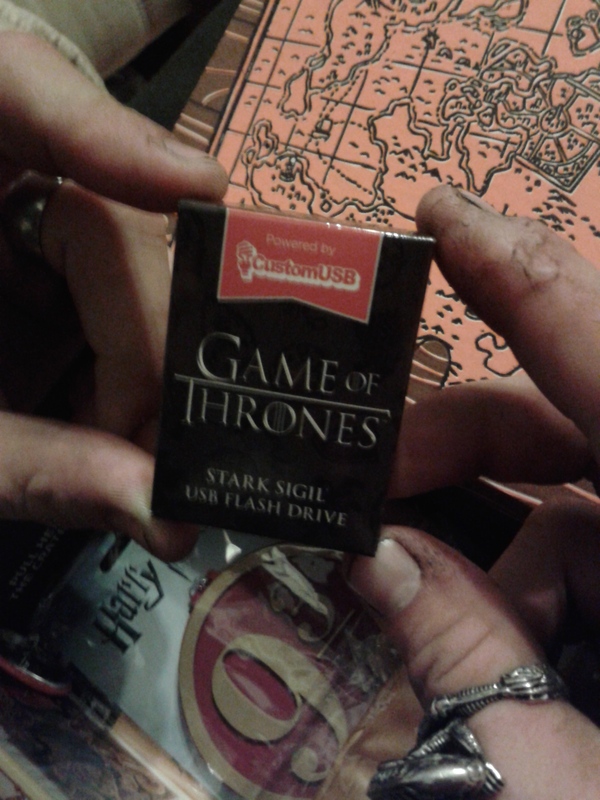 So having a House of Stark zip drive. This thing is awesome. It’s also fairly small so it will fit in your pocket or wallet easily. I don’t know if other people got different designs or not but I love the Stark one! 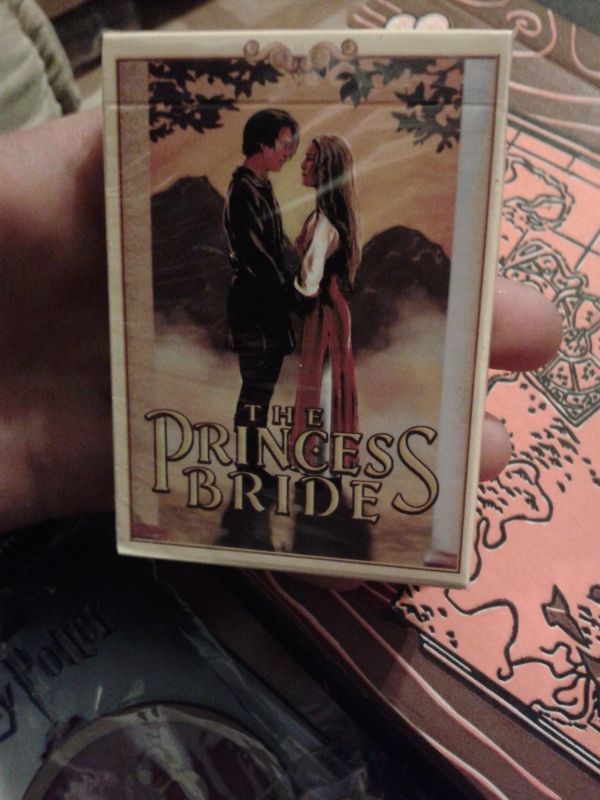 This is a deck of the Princess Bride cards. Which there is so much awesome involved with this. I mean first of all it’s Princess Bride. Plus we all know that there is so much fun to be had in a deck of cards. I mean I think these just will replace our zombie deck. This is an inflatable crown. I know this isn’t as cool as some of the other stuff but it’s just fun. 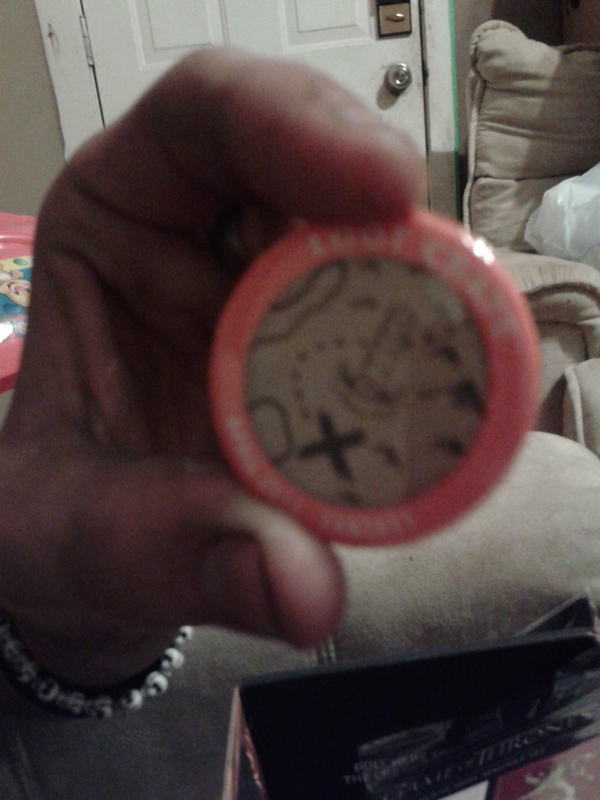 I know people tend to like stuff like this in there Loot Crate, they feel like they were ripped off. I personally like stuff like this. 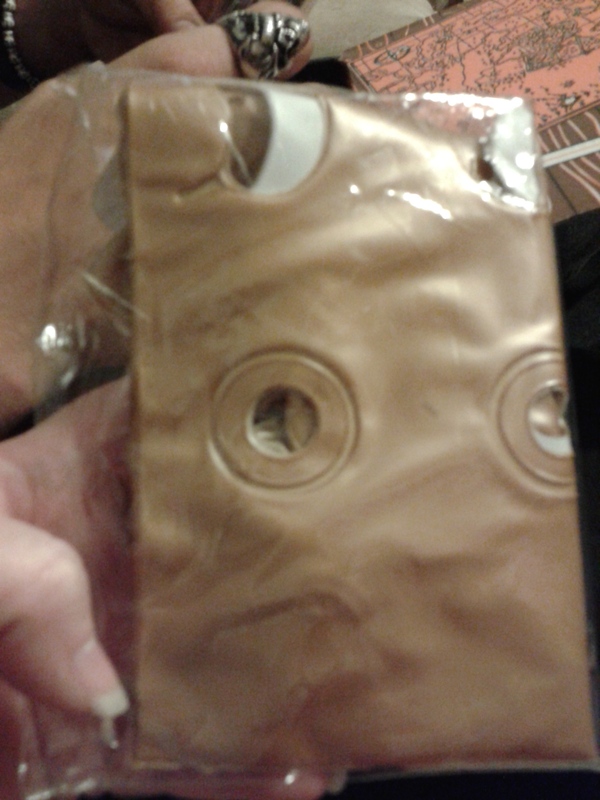 I’m going to inflate this and put this on one of my bears I think! This is a luggage tag. 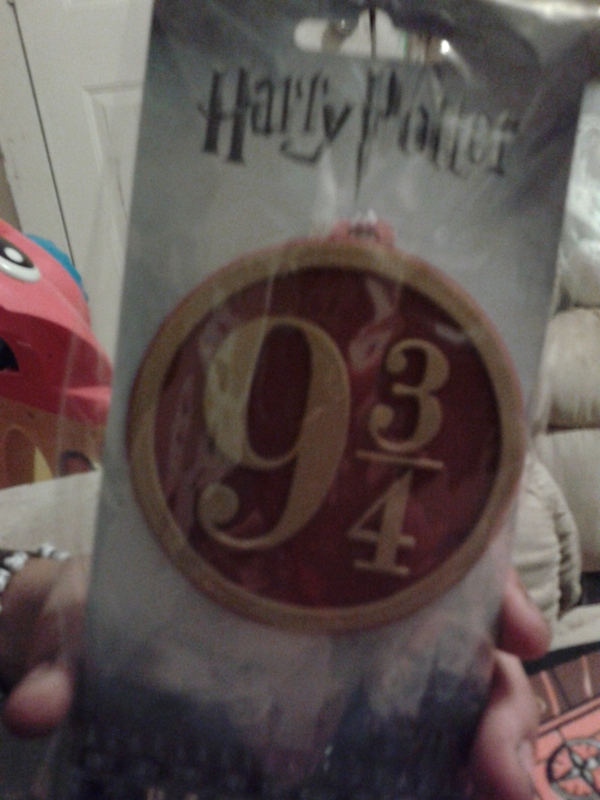 What could be cooler then a Platform 9 3/4’s tag. I think even small items like this add the much needed geek to your life. I mean luggage can be so boring. Plus who doesn’t need a new luggage tag? 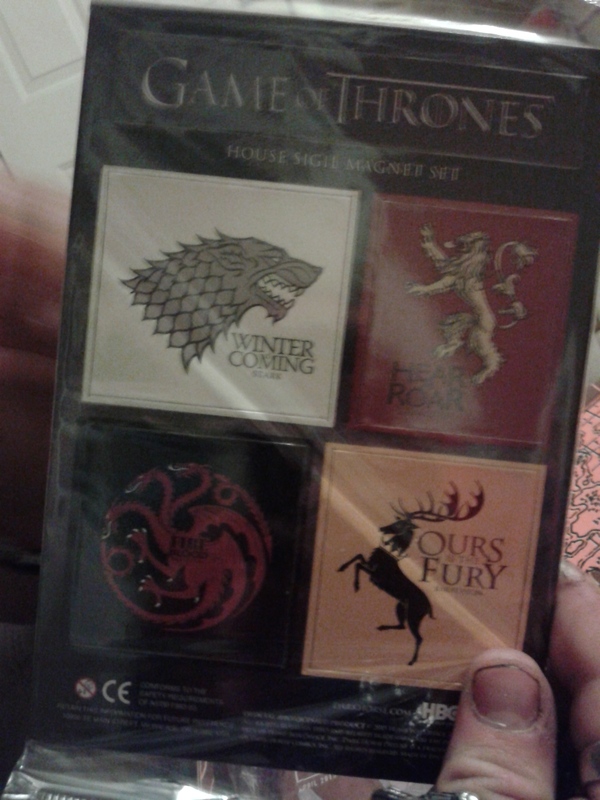 There was also Game of Thrones magnets. These look great on my fridge!! I mean I don’t know about the rest of you but my fridge is a geek wonderland. I have Star Wars, Marvel, DC, etc. So these just add to the awesomeness of my fridge. As always there is a button and a magazine that has some cool articles in it but also tells you about your items in your crate. 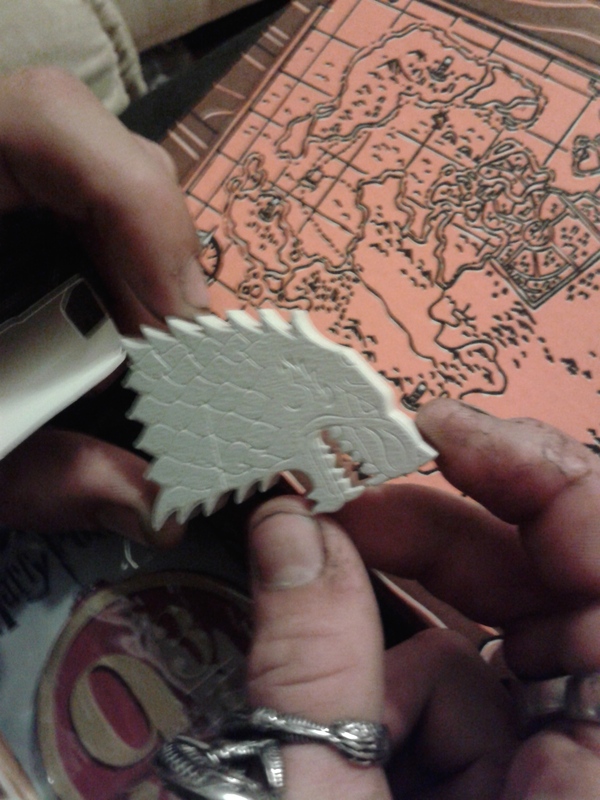 This entry was posted in Archive Entries, Reviews and tagged Dungeons & Dragons, Game of Thrones, Harry Potter, Lootcrate, The Princess Bride by ravenheather. Bookmark the permalink.